Redwood National Park is one of our favorite places to visit in the US. We’ve been to this park twice already and plan on returning for more. While getting there requires a well-planned road trip, once there, there’s so much to see and explore, this is truly a bucket list item for anyone traveling in the US. Visiting this park requires some preparation. Because it’s spread out across several locations, you need to know where you’re heading and plan your itinerary ahead of time. In this post, I’ll share my must-see list for this park, as well as practical information on how to get there, what to bring and where to stay. You’ll also get to see photos from our trips to the Redwoods! This is going to be a long post, so if you’re just “window shopping” for fun trips, I hope you’ll bookmark it (or pin it!) and come back when you’re ready to plan your trip. Where is Redwood National Park? While most may know this national treasure by the name: Redwood National Park. In the singular form. However, it’s actually made up of several state and national parks spanning a total of 139,000 acres. The entire complex of Redwood National Park is located in the northern part of California along the Pacific coastline, starting from the north at about 30 minutes south of the California and Oregon border. So, once you get there, what do you actually do? There are other types of forests and plant life to explore too. 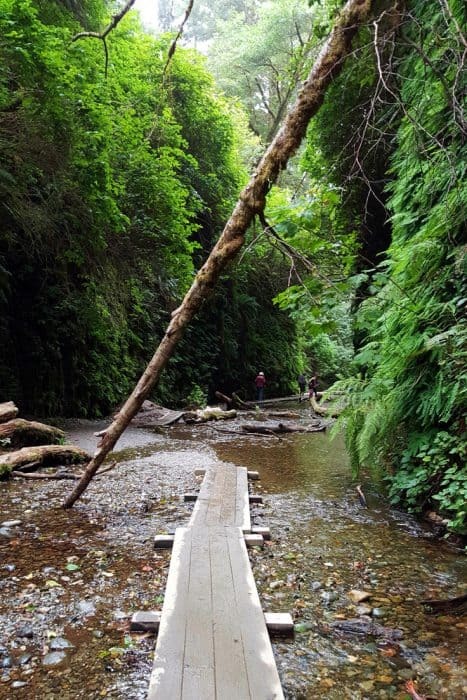 The one location you shouldn’t miss out on is Fern Canyon (more or that in a minute as we’ll list the park highlights). There are over 200 miles of trails within the National and State Parks. You can expect to encounter everything from beaches, prairies, to old-growth redwood forests. Elevations range from sea level to 3,000 feet. The difficulty will vary from easy to strenuous along gravel trails taking you to canyons and huge trees. Remember, whenever hiking in national parks, it’s best to talk to the rangers before you get on the trail. Phone in a day in advance if you don’t want to get to the visitors center. The Rangers will let you know what the current trail conditions are and warn you if there are flooded sections, mud on the trail or any other issues. A great way to experience this truly unique area is to spend the night in one of the campgrounds within the National and State Parks. There are several options for camping in both developed and backcountry campsites. I cover these in more detail later. This park covers a large area and has a variety of habitats to explore, so creating a short bucket list is challenging. I’m going to give it a try though. 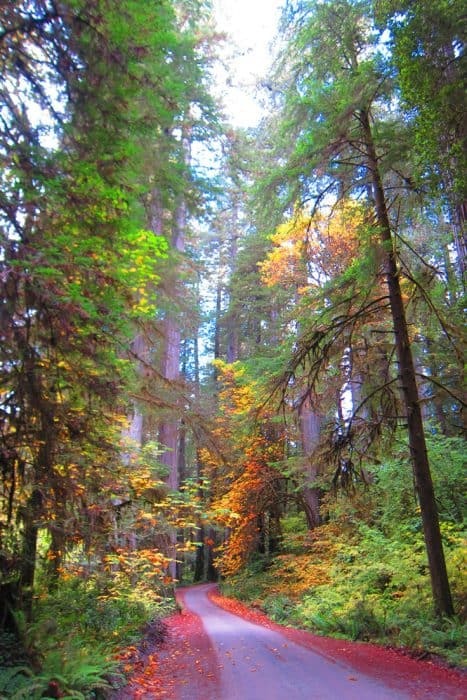 There are so many Redwood Groves around the park’s various areas. If your time is limited and you can only stop to see one of them, try this one. 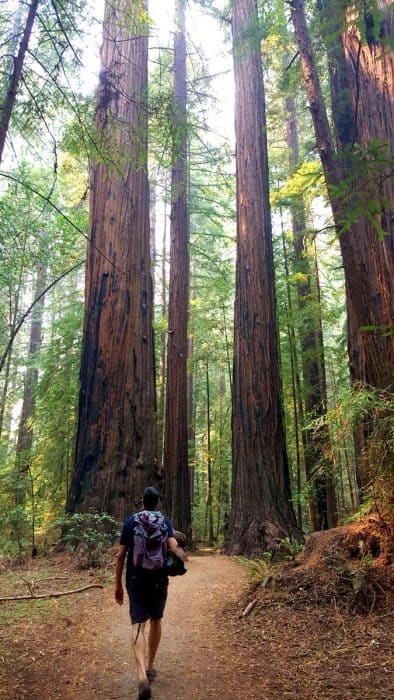 Located near the Prairie Creek Visitor’s Center, this one-mile loop of old-growth Redwoods is perfect. Just near enough the coast to be relatively wet and misty, we thought it was absolutely magical with all the huge ferns and other plants between the tall trees. I’m sure we’ll be back again someday. The Lady Bird Johnson Grove trail is also easy to access. Turn from the 101 near Orrick and a five-minute drive through the Redwood forest gets you to the trailhead. 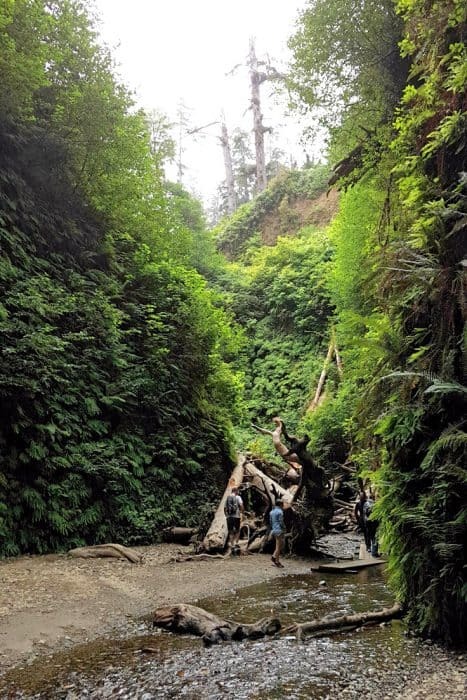 Located two miles north of Orick along Hwy 101, the winding Home Creek has formed a 50 to 80-foot deep canyon within Prairie Creek Redwoods State Park. Visitors can explore this area along an easy one-mile trail through the dense forest. The near vertical walls are covered in a variety of Ferns and moss. There may be running water down the canyon walls in wetter months. There are several trails in the area that can take you down into the canyon, or along the rim to take in the views. The park service installs footbridges over the creek in the summer months to help keep the trail accessible. Getting there is more of a challenge though. 4X4 owners will enjoy the dirt road and small stream fording on the way to the trailhead. When road conditions are good, you can do this in a regular sedan or a minivan (which is what we did). The streams were a bit scary but we saw other cars crossing them, so we went for it and were ok. 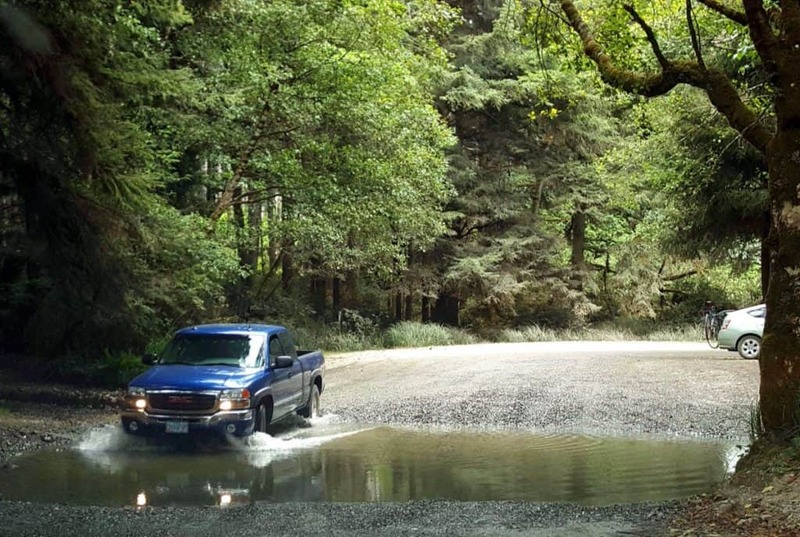 If you’re driving a rental, be aware that your insurance may not cover off-roading like this, so you may prefer to avoid Fern Canyon. Here’s another tip for you: The pay station to enter the park is in the middle of the entry road. We traveled for 20 minutes off-road before we got there. We were driving in two cars and would have only taken one if we knew we had to pay by car. But at that point, that would have meant going back for 20 minutes on a dirt road, parking one of the cars there and returning to the park. So we just drove on and paid for both. Once you’re there, it’s a gorgeous trail, no two ways about it. The first section of the trail was easy to hike but then we got to a point in the canyon where huge fallen trees sort of blocked the trail. To keep on, you had to traverse these by going under and over huge branches. Some of us did it – but older members of our parties chose not to. And if it looks familiar, that’s because this was the filming location for the Star Wars forest chase scenes! Located just outside of Crescent City along Hwy 199, Stout Grove offers some of the most beautiful Redwoods in the area. While not the biggest of trees to see in the Redwood National Parks area, this unique area has developed in such a way to become a photographers wonderland. The largest tree in the grove even has its own name and viewing platform. The Stout Tree is the centerpiece of the short hiking trail. If you are looking for the perfect picture, try to visit this area in the late afternoon to catch the best light. We loved the drive. Again, this is unpaved road so may be relevant for rental car insurance terms. It’s not a problem to drive it though (unlike Fern Canyon). Just south of Crescent City, Enderts Beach provides everything you can ask for in a northern California beach. Tide pools and driftwood are what this beach is known for. There is also a small canyon where Nickel Creek meets the Pacific ocean. The best time to visit Enderts Beach is at low tide. Crescent Beach Overlook is located at the end of Enderts Beach Road where you have access to the California Coastal Trail. The trail is open to both bikers and hikers. We hiked down to the beach early in the morning. The trail was glorious with the sun coming through the tree leaves. 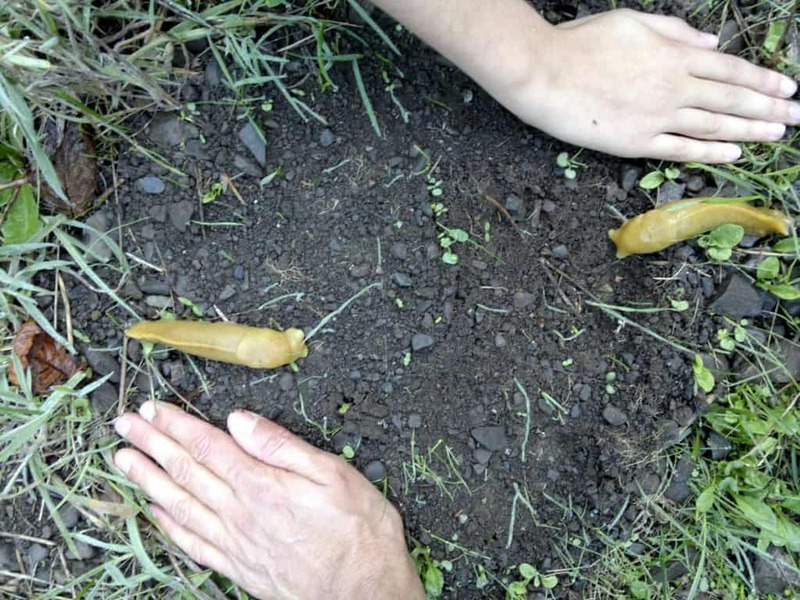 We got to see so many banana slugs on the way! The beach itself was beautiful too and we spent a lovely time there. Just two miles north of Klamath, the apply named Klamath River Overlook Picnic Area offers sweeping views of the coastline. A picnic area and several trails offering different views there are plenty of options for outdoor dining. The area features rocky cliffs and access to additional beaches depending on how far you want to hike. 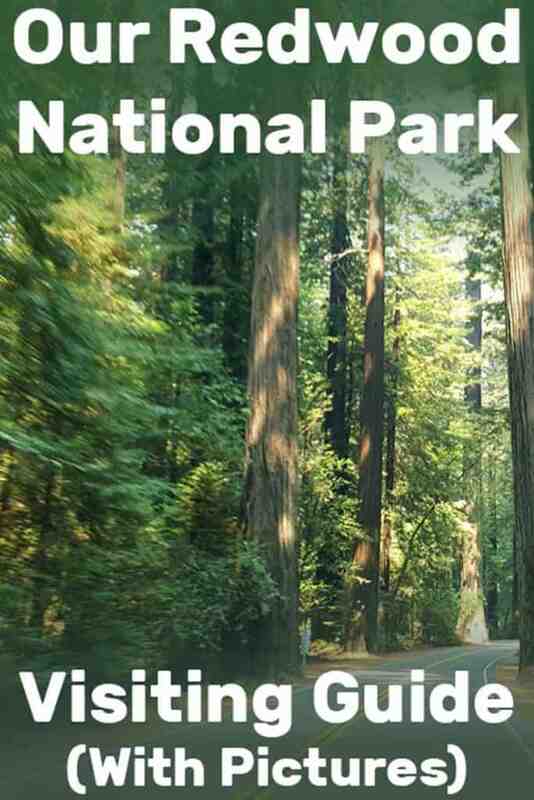 If you are looking to get off the beaten path, take a tour of Prairie Creek Redwoods State Park using the Newton B. Drury Scenic Parkway. While it’s only 10 miles long, this alternative to US-101 offers access to areas of the park seldom visited. We drove the entire route and hiked along it. Highly recommended. Be on the lookout for several trails along this route. There is something here for hikers of all skill levels. A moderately difficult hike located in Redwood National and State Park, the Trillium Falls Trail offers great views of redwood forests along with a small waterfall. A steel bridge helps you get close to the rock-filled falls. Plenty of wildflowers await for those willing to hike the full 3 miles to the viewing platform on the Prairie Creek Bridge. The Avenue of the Giants is a road section alongside the 101 between the towns of Garberville and Fortuna in California, marked as SR 254 on the map. 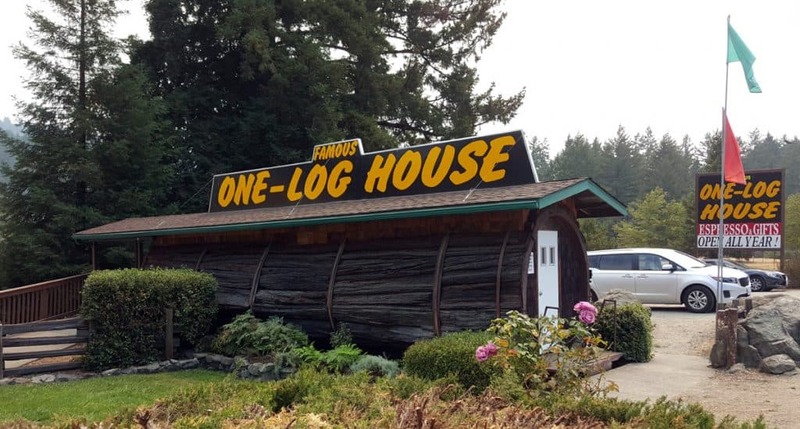 While technically not part of the Redwood National Park, I really think this is a must-do on your visit. The Avenue of the Giants goes through the Humboldt Redwood State Park. At the very least, drive this section of the road. It may not be a designated scenic byway but it’s definitely one of the most scenic roads we drove across in the United States. If you have some time, stop at a few groves to get closer to the big trees. This area is a bit more dry than the coastal Redwood areas in the National Park, so the forest has less vegetation between the trees, making them really stand out. At the very least, take 20 minutes to hike the Founder’s Grove. I was wondering whether to put this as an additional item in the park’s highlights but these trees aren’t really in the park, so this is more along the lines of a bonus item. And only if you feel like driving through a tree completes your Redwood experience. 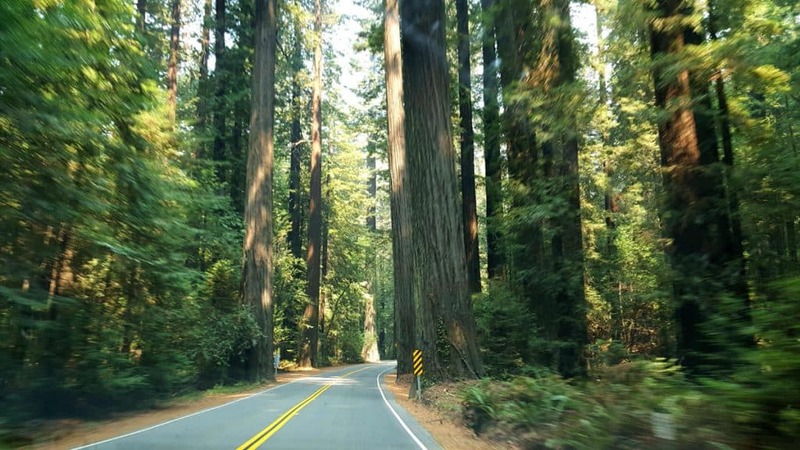 Located four miles south of the Humboldt Redwoods State Park in Myers Flat, this drive-thru tree is a must see. 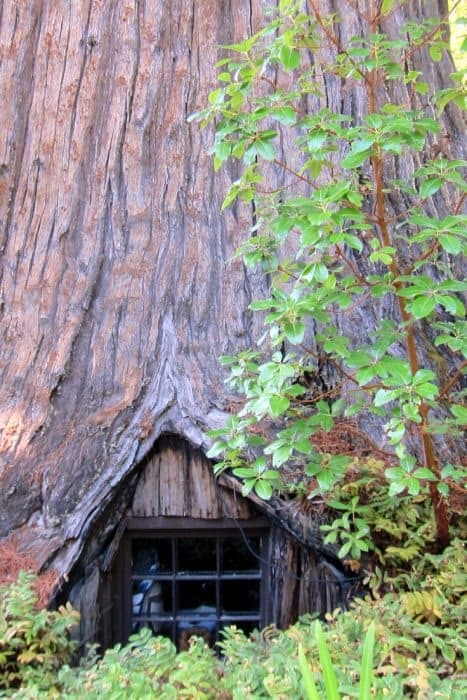 Along the “Avenue of the Giants”, this attraction also includes a 2-story tress house. 50 miles farther south along US-101, this drive-thru tree is located in the town of Leggett. There is also a pond and picnic area within this 200-acre park. Located an hour drive north of Eureka, this option is also just off of US-101. A stop here wouldn’t be complete without using the restroom made of redwood. We saw a few along the 101. I don’t remember where they were exactly (if anyone reading this knows – please leave me a comment!) but we just pulled off at stops to view them. You’ll have to drive to get to these parks and then drive between them as you visit various areas. This is one national park that doesn’t lend itself easily to public transportation. You can expect a long scenic drive to Redwood National Park along US-101 from San Francisco. The trip can take up to six hours along the coastal highway. Some refer to this 318 mile stretch of highway as a “dream drive” full of its rugged coastline and proximity to the Redwood forests. It’s a good road to drive but has some curvy sections. If you have some extra time on your hands, you could drive the section of Highway one between San Francisco and Fort Bragg. We did that on one of our visits. The road as scenic as the section between Los Angeles and San Francisco. Worth the drive but you have to give yourself at least an extra day as it’s slower and you should take the time to pull over, appreciate the scenery and explore the towns along the route. If you only take the 101, driving from San Francisco to the Avenue of the Giants (generally the southern part of the Redwoods) would take you approximately 4 hours. To get from San Francisco all the way to Crescent City, where the northern part of the park is, allocate at least 7 hours. Equally as long as the trip from San Francisco, the journey from Portland t the Redwood National Park area can take about six hours. You’ll be driving along the i-5 for most of the way, so it’s an easier drive all in all (even if less scenic). If you have some time, consider a stop at Oregon Dunes National Recreation Area. Located of UA-101 in Reedsport, this area offers a fairly unique landscape of wind-sculpted sand dunes. There is plenty of outdoor activities here to help break up the long road trip. Another 5-and-a-half-hour drive option, the 292 miles between Sacramento and the southern areas of Redwood National Park area offers a tour of northern California’s mountains terrain. Heading North along I-5 to Redding, you will begin to see the redwood trees this area is known for. If you are looking to shave some time off the trip to the park areas, there are flights from San Francisco to Arcata which only take about an hour and a half. There is also another regional airport in nearby Crescent City. Those flying in from locations farther away will need to first stop in a major international airport. Be sure to check for flights connecting in either LA, San Francisco, or Portland for the best deals on airfare. When’s the best time to visit Redwood National Park? One of the great things about the coastal areas of the West is that you can visit them year around. It rarely gets below freezing, even during winter time and it’s usually cool – and even cold! – throughout the summer. The main issue here is rain. It can rain at any time of the year but is much more likely to rain during winter months. The best times to visit would be June through October. Pack warm clothing, even if you’re visiting in July or August. While warmer than winter time, temperatures can easily drop to the 50’s and even lower during the night. Out there exploring the beaches, you’d want a good jacket in case it’s windy. A lightweight waterproof jacket with a hood is easy to carry with you and can be extremely useful in this area. Definitely bring good hiking footgear as well. Since it can rain any time of the year, trails could be at least a little muddy at times. How long should you take to visit the park? The answer really depends on what you want to do and how much you have. This is an ideal destination for hiking and camping. You could easily spend 1-2 weeks here for that. 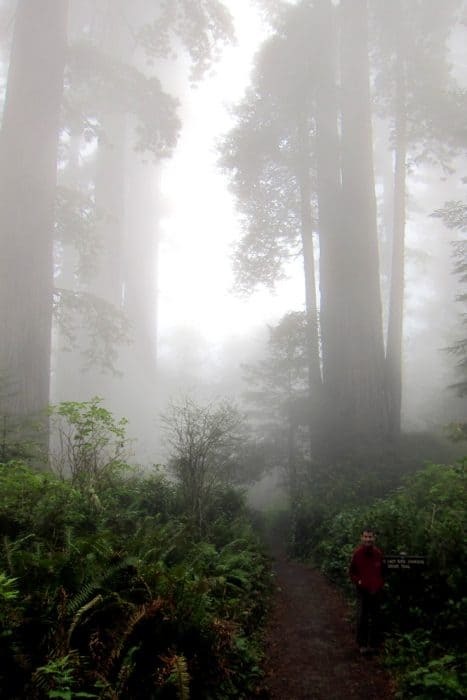 However, if your time is limited, allocate at least 4-5 days for a trip to the Redwood National Park. That’s 3 days to spend exploring the park itself, as well as a day coming in and a day going back. So, a total of five days is a good length. You could get away with a total of three days but you’ll miss out on many wonderful places you should visit. Unlike the southern part of California, this region is not densely populated. There are tiny towns and hamlets along the 101 but larger communities are rare. That’s why it’s good to know where the “cities” are in the area, in case you find yourself in need of a large shopping center or medical services. These two cities are right next to one another, so mentioned here together. They’re not large urban centers and have a small-town feel to them but between them, they have a population of over 40,000 people. It may not sound like a lot, but this is as large as cities get in Northern California. The central plaza in Arcata hosts the largest farmers market in Humboldt County as well as Main Street Oyster Festival. Boasting a large number of Victorian charm, this bayside city of roughly 17,000 people plenty to see while outside of the national parks. Located 100 miles south of the Oregon border, Eureka CA sits along the shores of Humboldt Bay. A bit larger than Arcata, Eureka is the largest coastal city between Portland and San Francisco. There is plenty to check out in this city of 27,000 people to include the Old Town Historic District and one of California’s oldest zoos. Only 20 miles from the Oregon border. Crescent City is home to the headquarters of Redwood National Park. Named after the shape of this important deep-water port, the area is home to several commercial fishing vessels. A small town with less than 8,000 people, Crescent City may be better known for being prone to tsunamis. They call it the Tsunami Capital of the US. Having faced more than 30 large wave conditions in the last 100 years, there is plenty of seafaring history to experience. Be sure to visit the Battery Point Lighthouse which is California’s northernmost lighthouse station. When we visited Crescent City for the first time, back in 2011, the memory of the previous large Tsunami was still fresh. My husband actually hitchhiked back from a long trek with a local resident of Crescent City who had lost his fishing boat to the mega wave. We loved staying at Crescent City. The beach is awesome and the locals were friendly. A great base for exploring Redwood National Park’s northern part. Don’t miss out on the local harbor with the sea lions hanging around on the boardwalks and of course, beach combing by the ocean! If you made it all the way through, I thought you might find a few facts about the park’s history interesting. Also, it’s worth mentioning the local wildlife (we love animals so this is a huge part of the attraction of national parks for my family). The star of Redwood National Park is the Coastal redwood tree (sequoia sempervirens). They are the tallest trees on earth. These are different than the Giant sequoia (sequoiadendron giganteum) which is another famous tree found in other California national park: Yosemite and Sequoia and Kings National Park. Both trees have reddish-colored wood and have the word sequoia in their scientific name. The difference is this: Giant sequoias are the largest trees on earth by volume. They have massive trunks, and are quite tall, but not as tall as the Coastal redwoods in Redwood National Park. 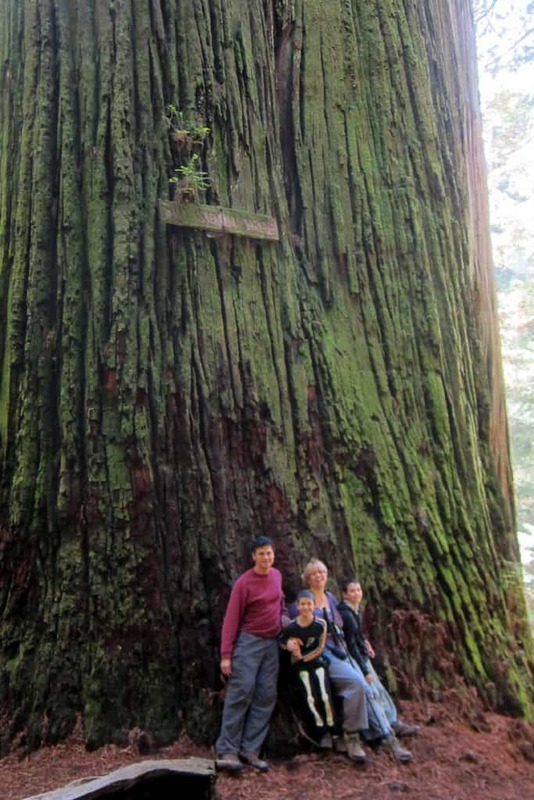 This article focuses on the area where the tallest trees grow: the Redwood National and State Parks. 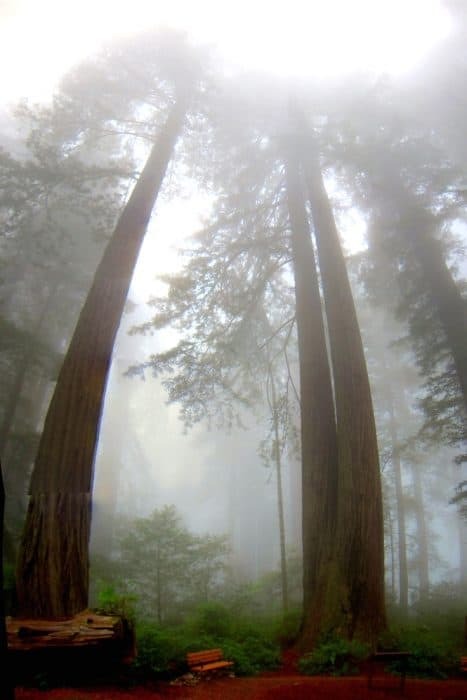 Originally inhabited by native Americans over 3,000 years ago, a minor gold rush in the 1850s brought settlers to the area know today as Redwood National Parks. Once the gold ran out the miners turned to log as a primary source of income until the early 1900’s when local citizens began forming conservation groups to preserve the forests culminating in the first of the national parks in 1968. 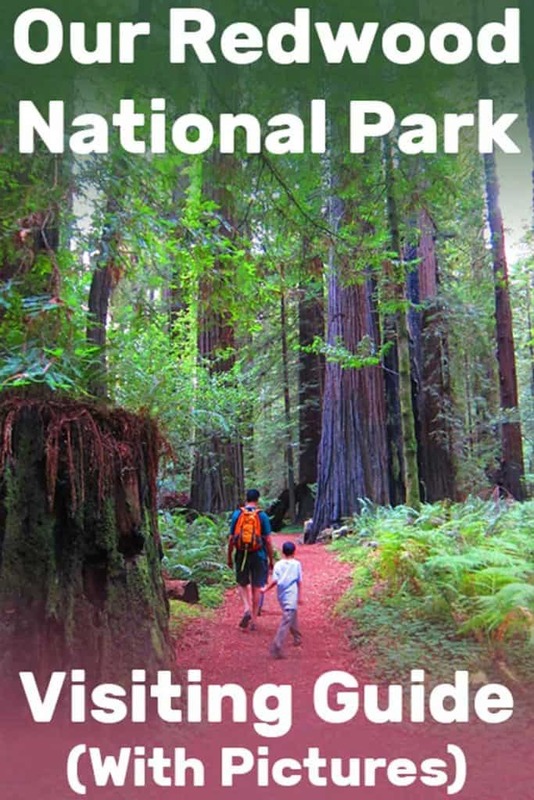 Redwood National and States Parks are now a designated World Heritage Site as of 1980. There is no shortage of wildlife to see here. The forests are home to bobcats, mountain lions, and black bears. 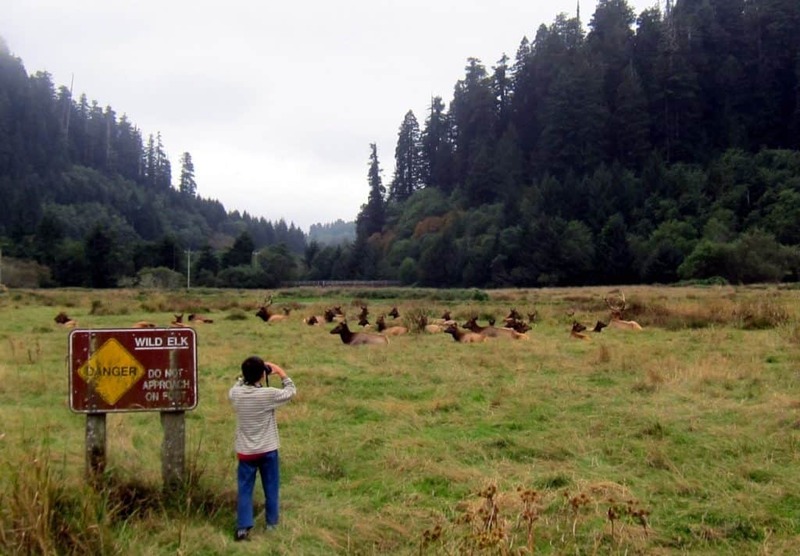 You can also find Roosevelt Elk and black-tailed deer in the lowland coastal areas. There’s a large herd of these Elks in the Prairie Creek area. We saw them on every visit, so they’re not hard to spot. Bird watchers love this area as there are 280 species recorded within the boundaries of the parks. 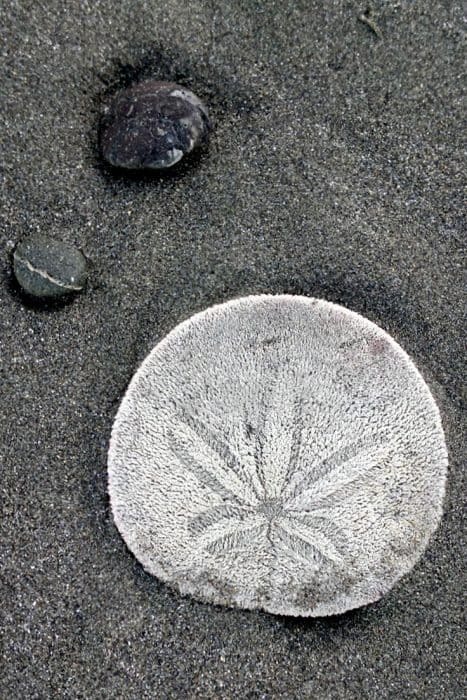 Venture out to the beach and check out the tidepools at low tide. You can find all kinds of invertebrates including anemones and sea stars. Another prominent feature is the Banana Slug. They can grow up to 7 inches and vary in color from bright yellow to brown just like a ripening banana. We saw dozens of these huge invertebrates on the trails. The wetter the area, the more slugs you’re going to see. With the park covering such a large area, this takes some planning. On our first visit, we took a week to travel from San Francisco to the national park and back. We spent one night on the way up north in Ukiah and another on the way back in Fort Bragg. In between, we stayed at Crescent City for four nights. We spent the three full days there exploring the Jedadiah Smith area of the park and the beaches. The days of getting to and from Crescent area were dedicated to the southern parts of the park. On our second trip we were driving from San Francisco to Oregon, so just stopped en route to see more places. We stayed at the Quality Inn in Arcata and continued on the following day. If you’re planning the trip, I suggest making your reservations in advance if you’re coming during the high-season of July-August or any holiday or long weekend. Prices are much cheaper if you book in advance simply because the cheapest places fill in first. Tried and tested. If you enjoy this guide, I’d really appreciate it if you could use these links to Booking to make your reservations. You’ll get the best possible price and they will also cut me a small commission. Thanks in advance! Offers an indoor pool and hot tub, free WIFI, and is only 5 minutes away from the parks. Only a mile and a half from the Pacific Ocean, this hotel offers free WIFI and a continental breakfast. This hotel is located only 3 miles from the Redwoods park headquarters. They offer a deluxe continental breakfast and high-speed internet. Rated the as best value in Arcata, this hotel is also on the National Register of Historic Places. They feature free WIFI and bathrooms equipped with cast-iron claw foot bathtubs! Located 3 miles from Humboldt State University, this location offers free WIFI and an outdoor swimming pool. There are only eight basic cabins located in the Redwoods National and State Parks. Four are located in Prairie Creek State Park, and the other four are within Jedediah Smith State Park. Prices range from $100 per night in the summer and decrease to $80 per night in winter. Cabins can be booked using Reserve California. There are four developed campgrounds and seven backcountry campsites located throughout the park. Reservations can be made up to 6 months prior to your trip, and highly recommended if you are looking for a particular campground. Campsites in California State Parks are booked using Reserve California and will restrict campers to booking their site no less than 48-hours in advance. Several of the state campgrounds were made back in the 1940s and due to size restrictions, large RV’s and travel trailers may not be allowed. Be sure to check if the campground you are selecting has campsites that can accommodate your rig. Summertime is peak season for the Redwoods, so do your best to plan ahead as sites routinely book well in advance. Standard camping fees are $35 per night. Located 10 miles east of Crescent City this campground is open year around. Offering 86 campsites for both tents and RV’s, there are no services at the individual campsites. There are communal showers and restrooms as well as a dump station. RV’s are limited to 25 feet and travel trailers to 21 feet. 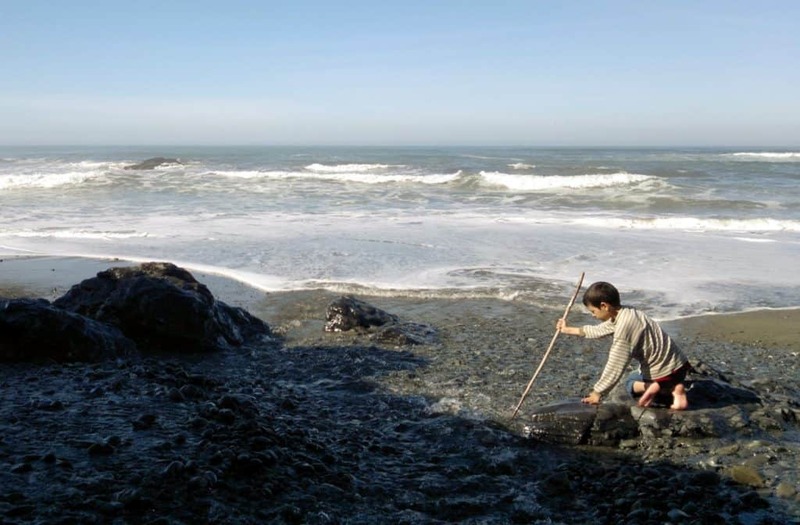 Just south of Crescent City, this campground is only open May through September. There are 145 tent and RV campsites offering communal showers and restrooms. There are no services in the individual campsites, however, accommodates larger vehicles. RV’s are limited to 28 feet and travel trailers to 24 feet. This year around the campground is located 6 miles north of Orick and offers 75 tent and RV campsites. As usual, there are no services at the individual campsites but offer communal showers and restrooms. RV’s are limited to 27 feet and travel trailers to 24 feet. Offering access to a secluded beach and close proximity to Fern Canyon, this 26-site campground is available to both tent campers and RV’s. There are communal restrooms and solar showers, however no services within the campsites. RV’s are limited to 24 feet, and trailers are not allowed. This campgrounds availability is subject to funding, so best to call prior to arrival. Backcountry permits are only available in person at either the Hiouchi and Kuchel visitor centers. 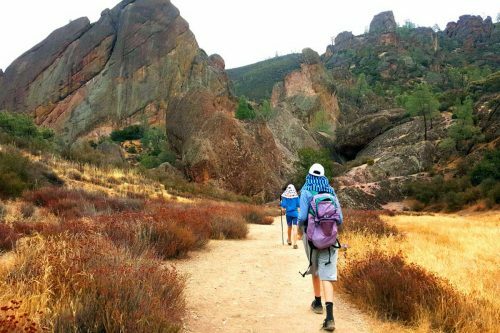 You can get these free permits up to 24 hours before you plan to begin your hike. Best to plan ahead and have a few options in mind as permits are given out on a first come first served bases. There are seven designated backcountry sites whose access varies from easy to strenuous. Some also allow for horses and bikers. You can generally find a picnic table, fire rings, and a toilet in these areas. Keep in mind that this is bear and mountain lion country, so store food and travel appropriately. Some sites are subject to weather and season. With the variables in terrain, those wishing to use these sites should research the area extensively. Will you be visiting this national park? Or perhaps you already visited? I’d love to hear from you! Leave me a comment with any question or feedback, even just to let me know you’ve made it through this long post *wink*. What to Pack for Lake Tahoe in Summer? What’s the Best Neighborhood to Stay in LA When Traveling?